Sydney's new boutique development, Silver Street Terraces, provides contemporary terrace living in Sydney's inner west, St Peters. Developed by PNC, the three and four bedroom terraces each feature 2.5 bathrooms ranging from $1.45million for three bedrooms to $1.6 million for four bedrooms. 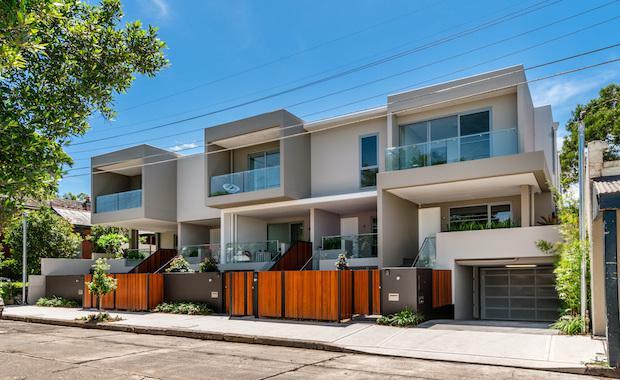 Located at 5a – 9a Silver Street, the five brand new Torrens title homes are superbly appointed throughout and with versatile floor plans which were conceived to maximise natural light and a seamless transition from indoor to outdoor areas. Set on blocks ranging in size from 201 square metres to 294 square metres, all homes feature premium stone kitchens with ample storage, gas cooking and SMEG appliances and meticulously appointed interiors with polished concrete floors to living areas. Internal areas range from 159 sqm to 245 sqm plus external areas of 119 sam to 184 sqm, giving expansive free flowing designs to encourage solar access and easy entertaining, each terrace features a generous and beautifully landscaped garden with a sunny northerly aspect. The boutique development incorporates high end comfort inside and out, with double security garaging and storage areas, ducted reverse cycle air conditioning, security alarms and video intercoms. Knight Frank’s Joint Managing Director, NSW Project Marketing and exclusive marketing and sales agent, Noel Lucas-Martinez, said the Silver Street Terraces are perhaps the finest new terraces to be completed in and around St Peters and truly reflect how this inner west suburb has evolved. “Located only six kilometres to the CBD and in close proximity to parks, universities and train stations, the luxurious boutique development boasts flexible floor plans to provide for additional multipurpose rooms which are perfect for today’s varied living,” added Mr Lucas-Martinez. According to Mr Lucas-Martinez, the Silver Street Terraces will appeal to a wide target market from local purchasers, empty nesters and downsizers to international investors and expats.